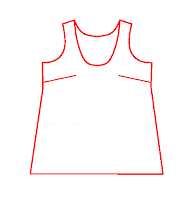 Basic A-line sleeveless top pattern. 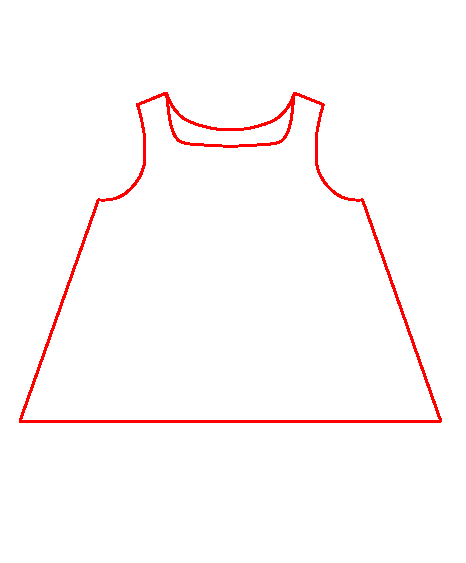 Trace the basic A-line sleeveless pattern - to make a copy, since we'll be cutting it up. Draw yoke on the pattern. Add fullness to the bottom part of the pattern to make it wider. Yokeline is measured 8 cm from the neckline - this is arbitrary - I measured it from the Week 1 top where I thought the yokeline should be. Draw a line perpendicular to the center seamline. In the back... the position of the yokeline is again arbitrary, but I chose it to be about 1/4 of the bodice original bodice length measured from the top to the waisline (WL) – based on “Paternmaking..” by Joseph-Armstrong. Before we cut out the yoke we need to figure out where to add fullness to the pattern. We will be adding fullness only to the hemline, not to the yokeline. When you are adding fullness to a skirt or a ruffle, you usually divide the pattern into equal parts and then spread them. But this is not a skirt or a ruffle, and it just did not seem right. Instead I did something similar to the A-line shirt from the Bunka Blouses and Dresses Textbook. In that exmample, fullness was added at width lines (both front and back), and along lines extending down from bust point (BP) in the front and the shoulder dart pivot point in the back (goodness, this sounds terrible, but read on...). The first line where we add volume - draw a line from BP down to the hemline and up to the yokeline (I know, you can barely see it in the pic. I will take note and make it better next time). Now the next one... Overlay your pattern over the front bodice (approximately) and then draw the width line (parallel to center seam) all the way to hemline. What is width line? 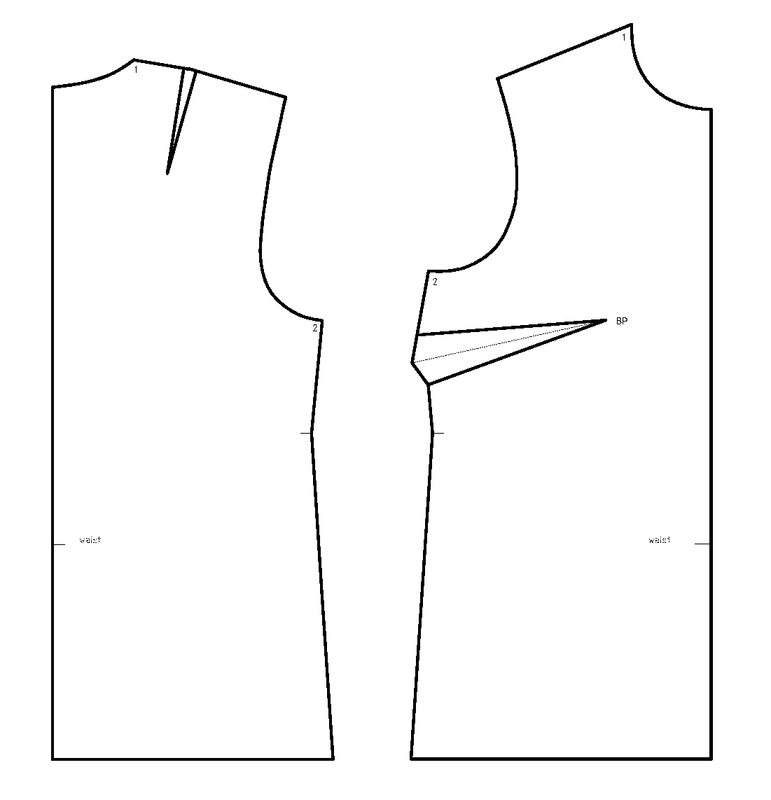 It is a line parallel to center seam at the narrowest point on the bodice. Bodice is narrowest approximately in the middle of the sleeve curve (see the dashed line on the pic). In the back... Again overlay the pattern over the back bodice, and draw the width line as explained for the front. The other line we will use to add volume extends from the shoulder dart pivot point (the top of the dart) down to hemline. Both lines are parallel to back center seamline (note to self: I really need to use a darker marker). This is the new bottom part of the pattern, front. Repeat this for the back. Note that we added fullness radially from top to bottom, adding flare to the bottom, keeping the same width at the top (at the yoke line). This is also called "one sided fullness". Note also, that the yokeline is no longer straight, but that's OK, it is the same length as the corresponding seam on the yoke, so it will fit together. (those are my sons' scissors - they were just handy...).